Some teams are able to creates dynasties, while others find the formula to success only once. The same amount of effort is put in by both teams, but sometimes it just doesn’t work out as planned. It is probably harder to repeat as Champions then to win the first one, just due to the overwhelming demands. Demands on time, personal appearances, team obligations, media interviews and the list goes on, because everyone wants a piece of the Champions. The 1990 Cincinnati Reds were one of those one and done teams. 1990 was a lightning in a bottle year for them and I have found a book that chronicles the whole season. The 1990 Reds seem to be one of those team that gets lost in the shuffle. They led the league from the season opener to the final day. At the time, they became one of only three teams in the history of baseball at that time to do that. Then, they went on to sweep the heavily favored Oakland A’s in the World Series. It truly was a magical year for the Reds. 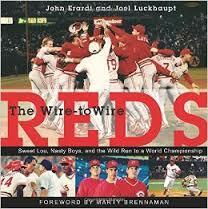 Erardi and Luckhaupt have written a book that takes a look at all the exciting moments in the 1990 Reds season. It shows all the highlights of the season that came their way, and how the team persevered a grueling baseball season to stay on top from beginning to end. The authors also take a look at all the personalities that made the Reds so special. Being led off the field by Sweet Lou Piniella, and on the field by Hall of Famer Barry Larkin, the Reds but something special together. Players like the Nasty Boys, Eric Davis, Chris Sabo and off field personalities like Marge Schott, gave this team a personality that the fans of Cincinnati fell in love with. It seems to me that some of the World Champion Reds teams fall through the cracks of history. They never seem to get the recognition they deserve. I think it has happened a few times with the prior Reds championship teams. Perhaps it is their location in Cincinnati that allows them to be forgotten, I am not really sure. Baseball fans should enjoy this book. It gives a nice review of the entire 1990 season for the Reds. I have a feeling at the time most of us were not necessarily paying attention to what the Reds were doing, so you can take a look at what we all missed.